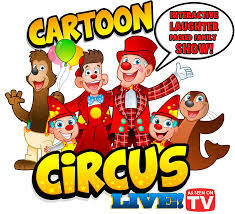 All the fun of the circus comes to Oswaldtwistle Civic Arts Centre & Theatre on Thursday 21st February at 1.30pm when the laughter-packed stage show "Cartoon Circus Live" combines the comedy of pantomime with the thrill of the circus. The 80 minute Half Term Holiday show features some of Britain's funniest clowns, traditional slapstick comedy, magic, illusions, balancing, high flying diabolos, cartoon characters, plate spinning, an acrobatic human slinky, puppets, prizes and surprises. There is even a performing piranha. All tickets are £7. Tickets only £5 for groups of 10 or more! BOOK NOW! LIMITED SEATING!